As a brief refresher, back in October I attended a press tour of the Netherlands’ biopharmaceutical industry sponsored by the Netherlands Foreign Investment Agency (NFIA). Here are links to all previously published blogs in chronological order. In my last blog I shared experiences from the morning of day 3 (Wed., Oct. 3, 2018) on the tour. But there was much more to see. Following our visit to the Utrecht Science Park (USP), we headed to our final destination, Amsterdam. We pick up the tour with a working lunch at the O|2 Lab Building located on the Vrije Universiteit Amsterdam (VU) campus (one of two publicly funded research universities in the city, the other being the University of Amsterdam, combined enrollment of > 50,000 students). As in the other cities we visited in the Netherlands (i.e., Leiden, Radboud and Utrecht) where universities are closely tied with medical centers, such is also the case in Amsterdam. 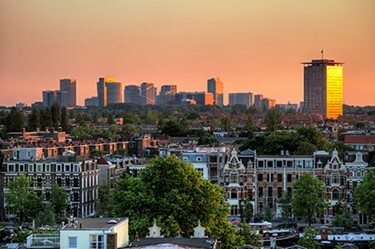 However, in Amsterdam there were two university medical centers, the Academic Medical Center (AMC) and the VU University Medical Center (VUmc). I say “were,” because in June of 2018, the two completed an administrative merger, an outcome of an intensive multi-year planning process, and as of this moment are operating under the collective name of Amsterdam UMC. From a legal perspective, AMC and VUmc will remain separate entities (e.g., retain their own employee agreements, supplier contracts and individual financial statements), though there are plans to cluster specific patient groups in one of the two locations over the next several years. For example, pediatric intensive care will now be conducted only at the AMC location. Combined the two facilities have over 1,700 beds, employ around 15,000 professionals, and are home to eight integrated research institutes, which you can learn more about by going to www.amsterdamresearch.org. The working lunch began with company and organization PowerPoint presentations (or pitches as the Dutch are fond of saying). Guus A.M.S. van Dongen, Ph.D., professor at Amsterdam UMC’s VUmc campus, kicked off the pitches discussing the important role the Imaging Centre plays in drug development. “We use imaging first at diagnosis to determine the type of disease, where it is located, and how aggressive it is,” stated Dongen. “Then we want to use imaging to see where we can hit the disease (e.g., surgery, radiotherapy).” But one of the challenges Dongen noted is clinicians usually can’t see what the drug is doing in the body. “Yearly we [society] spend €1,000 billion on drugs, which are effective (on average) in only 40 percent of patients,” he said. “Cancer drugs are effective about 25 percent of the time, lung cancer about 15 percent, and ‘effective in oncology’ means a few months longer life expectancy.” As drugs like monoclonal antibodies (mAbs) are very expensive, researchers at Amsterdam UMC wanted to be able to label them and use positron emission tomography (PET) to confirm and quantify selective tumor uptake of targeted molecules. “We developed very simple chemistry and the protocols, and we produce the zirconium-89 (89Zr) right here, which is now used worldwide,” he shared. Guus A.M.S. van Dongen, Ph.D., professor at Amsterdam UMC's VUmc campus, discusses the important role the Imaging Centre plays in drug development, Oct. 3, 2018. Next, we heard from Ivo Jansen, M.D., Ph.D., chief medical officer at Nicolab, a company resulting from a collaboration between Amsterdam UMC and health tech venture builder, NLC. This company developed StrokeViewer, a technology using AI currently being rolled out in several Dutch hospitals. StrokeViewer offers physicians clinical-decision support through complete assessment of relevant imaging biomarkers within 3 minutes, allowing for faster treatment decision making in patients experiencing a stroke. 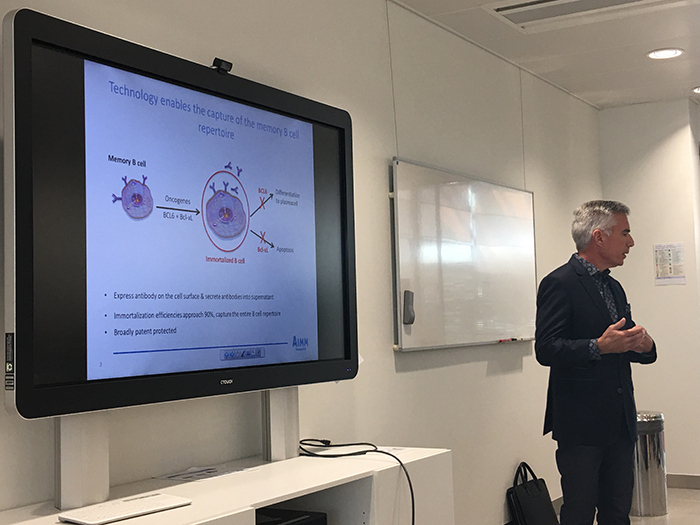 Robert Jan Lamers, CEO of Arthrogen, provided an overview of the Amsterdam-based clinical-stage biopharmaceutical company currently developing local gene therapy for inflammatory diseases using viral-mediated gene transfer. 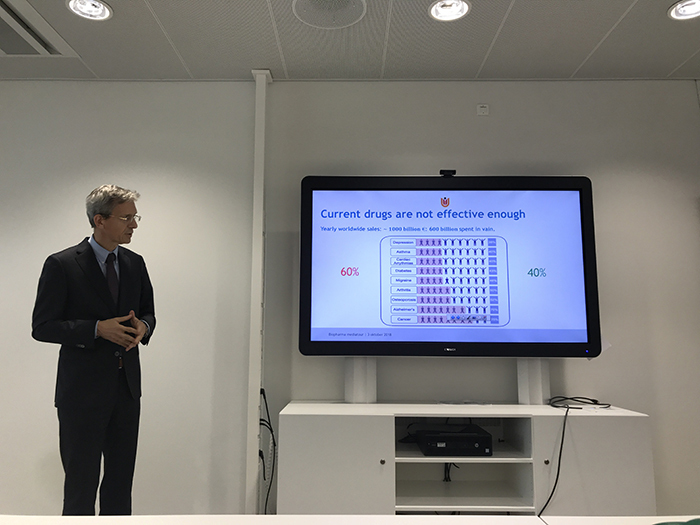 John Womelsdorf, Ph.D., CEO of AIMM Therapeutics, conducts presentation at O2 building in Amsterdam, Oct. 3, 2018. Following a guided tour of O|2 Lab Building, we proceeded to the Netherlands Cancer Institute (NKI) (which you can learn more about via this short video), where we were provided a detailed overview of NKI by John Haanen, Ph.D. This was followed by Markwin Velders, Ph.D., VP operation and managing director, Kite Pharma, a Gilead Company, who explained the company’s decision to open a new 117,000-square-foot facility in the Netherlands to advance production of its cancer cell therapies, which you can read more about here. Next, we learned about Sanquin Research (responsible for the safe and efficient blood supply in the Netherlands on a not-for-profit basis), and Sanquin Plasma Products, which manufactures plasms -derived medicinal products (PDMP’s), obtained from clustered pools of recovered (individual blood donations) or source plasma (plasmaphaeresis) donations. Our three-day Netherlands’ excursion concluded with a tour of the National Screening Laboratory for Sanquin (NSS), which is responsible for the screening of all blood and plasma donations in the Netherlands. I’d like to extend my sincere appreciation to Sandra de Wild-Chardonnens, strategic advisor life sciences and health, NFIA, for organizing this comprehensive tour of the Netherlands’ biopharmaceutical industry, and Kaitlin Lapka and Madeline McDaniel of Development Counsellors International (DCI), for facilitating travel and logistics of the tour. Thus concludes the Netherlands’ press tour.